Philips can turn stereo sound to surround sound in seconds | What Hi-Fi? Two speakers and a subwoofer can be a 5.1 system, says Philips at IFA. Here in Berlin at IFA 2015, Philips has taken the wraps off a speaker system that wants to be your one-stop stereo and surround-sound solution. It's called Fidelio E6. 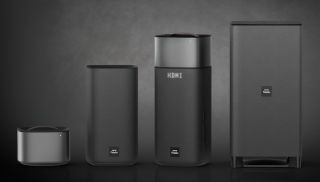 It consists of two wireless speakers, each 40cm tall, and a wireless subwoofer. Each speaker has a detachable, battery-powered top section that can be removed and placed elsewhere in your room as, say, a rear speaker. Philips claims its Spatial Calibration algorithm ensures perfectly balanced surround-sound regardless of where the speakers are positioned, and the batteries powering the detachable modules are claimed to be good for five hours' use on a single charge. To emulate the presence of a centre speaker, each of the front speakers features an angled three-inch driver designed to direct sound to the centre of the soundstage. The E6 also features HDMI inputs and 4K UHD pass-through for use with up-to-the-minute home cinema sources, and has Spotify Connect and Google Cast built in. It will pair with up to three Bluetooth devices at a time, so you can enjoy a battle for control of the music you listen to. The Fidelio E6 is due to go on sale at the end of the year, priced at €900. UK pricing will follow.